It sounds like a simple question doesn’t it? Almost an insult to our intelligence, right? But, do you really know how to use a copy machine? 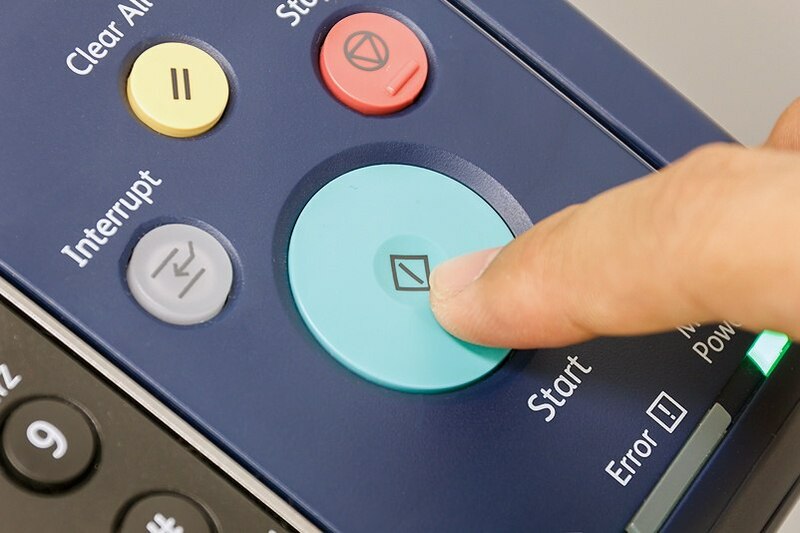 You would be surprised how many people don’t know the simple functions of a copier, or even more, how to take advantage of all of the technology that is available on these machines. Copiers can really be used as a great tool when it comes to office technology and automation. Make sure the machine is powered on and warmed up. Check to make sure there is enough of the correct size paper loaded into the machine. Lift the feeder and check the glass to make sure that there is no dirt, marks, or other items left on top of the glass. Place a single sheet (original) or item you want copied face down on the glass in the proper position (read and follow the guides). Close the feeder on top of the glass and your original. Remove your copies and check them to make sure that they are what you wanted copied. Remove the original and leave the machine exactly as you found it for the next person in your office to use. If you are copying more than one page, place your stack of pages in the Automatic Document Feeder (ADF) on top of the machine (usually top of the page, turned up and facing left). Your copier may be on the network, and you may be using it as your printer or scanner. If you are, make sure you pick up your prints after you send them and if your file gets stopped in the online print queue, make sure to clear it, so others don’t have to wait on you. Ok, now you’re saying to yourself, “everyone knows those basics.” But If they did, then when you go to use the copier in your office, why doesn’t it work? It’s a complete mess, or it’s just not working properly. It’s usually due to a variety of reasons. Following these simple rules will save you time and money on maintenance and repairs later on. Use correct paper – this is fairly easy to follow, a copier needs to be fed the correct size and thickness of paper, or it will jam. Paper comes in different weights (thickness) ranging from 20 lb. bond paper ( the typical white paper you buy in cases) to thicker weight, the most common is 110 lb. card stock (the same thickness of index cards). Not all copiers can handle thicker paper. Make sure you read your copiers specification to make sure you are running the proper paper thickness through your machine. Note: you may even have to make some changes to your settings or put the thicker paper in the bypass tray. Your copier paper could also be working against you. Make sure the glass is clear of scratches and clean. This is a very important one. If your glass is not clean, then your copies are going to show it. Every scratch, scrape, and piece of dirt will be seen on every copy. If you are wondering if you can use Windex to clean it, you can. Here’s why. Make sure that you purchase and use the right type, clean, and the correct thickness of paper based on the manufacturer’s specifications of your copier. If you’re not using a surge protector, you should. If you have the budget and know-how, a power conditioner should be used to connect the copier too. Position the copier in a strategic location on your office floorplan where it’s centrally located providing access to most of your staff, but make sure there are enough clearance and room around it for someone to walk directly behind someone that is using it. The copier should be a tool, not a roadblock restricting office pedestrian traffic. Place your copier in a tight space or cluttered area. They need to breathe. Funny huh? Well they heat up, just like any other office equipment and need to be in a ventilated area or they will just recycle the air that leaves the equipment, and it will just get warmer and warmer until it overheats and breaks down. Place it outside the office or in an office restroom. You think we shouldn’t have to recommend a copier positioned in either of these types of situations, but it’s happened. Try to do anything with the copier that it wasn’t designed for. It doesn’t print on wood, plastic or metal. You can’t run different sized paper or items through it. Try to clean the glass with anything other than a soft cloth and glass cleaner. Let whiteout or ink dry on paper before running it through the copier. Want to make sure you keep your copier in good working order, here are some tips and guide on keeping your copier up and running longer. When using a copy machine at a retail store, keep in mind they get a lot of use, and if they’ve been there for some time, then you need to make sure that you check a few things, so you don’t go spending your money and get poor results. If you are at a retail store using a copier, you need to make sure to run a few test samples. By running a blank copy first, you can see if there are any defects on the glass or in the copying process. If it’s the glass, you can always clean it. If it’s the copier mechanism, then I recommend you go to a different machine or try a different store. Enlargements – Review the display panel on the copier and look for a setting to enlarge your copy. This usually can be done in percentage increments or from a paper size setting (e., letter to tabloid size). Scanning – Many copiers of today have an ADF above the glass. This allows users to copy or scan many pages at once at a high rate of speed. Duplexing – This feature allows pages to be printed on both sides of a page. This is especially useful for thick reports to cut page usage in half. Collating – Allows you to make copies of multiple pages and then automatically sort them eliminating this manual task. Faxing – Copiers have added this feature so that your staff doesn’t have to go to multiple devices for different office tasks. This usually requires a phone line, fax hardware and software to send and receive faxes. Binding (stapling, hole punching, and folding) – A copier with additional hardware, can do a variety of types of binding for booklets. You can now staple either in the corner of a document or along one side, perform 2-hole or 3-hole punches, and fold along one side for a booklet or a tri-fold brochure. Copying part of a page – This feature allows for you to select certain areas of a page that you want copied. The copier usually will scan the page and then allow you to select certain areas of the original copied. Save to PDF or Microsoft® Word File – With additional software copiers can scan your documents, convert and save them in an Adobe® Acrobat® PDF file or even scan a document, read all of the characters, convert it into text and then save it as a Microsoft Word file. Send to email or network folder - Copiers can now scan documents and email them directly to pre-defined or manually entered email addresses or groups or save the documents directly into directory to provide easy access to other staff. Security and encryption – Today’s copiers have the ability to secure the machine and the copying and even encrypt documents that are scanned and stored on your network. Mobile printing –A copier doesn’t only have to copy; it can print from just about any device. Mobile printing software is available for both iOS and Android devices. Grading School Papers – With properly configured software a copier can enhance teacher productivity by printing bubble sheets for tests and then grade those test automatically using the Automatic Document Feeder and scanner. Remote monitoring and diagnostics – A copier that is network capable can allow service technicians to upgrade software, perform diagnostics and remote monitor the overall health of your device and can alert technicians when a service maintenance call is needed. Automatic toner ordering – the copier machines today when networked can alert your staff or even your suppliers when the toner is low and automatically order replacement toner on predefined ordering levels, so you never run out of toner supply. At AIS, we have seen copiers being used correctly, and we’ve seen them used incorrectly. In 2016, we made over 12,000 service calls to our clients and have a good idea when on site if the copier is misbehaving based on normal wear and tear or “copier abuse”. These are complicated machines, and we understand that there is going to be a turnover of employees in every office, so we recommend that if you think your staff needs a refresher course in how to use a copy machine, then we are happy to help. And if you would like to see how a copier can be used to help you optimize workflow, manage documents or decrease labor costs, then you should contact us for a demonstration of the latest advancements in copier office technology.